Happy Thanksgiving everyone! That pumpkin pie I ate today sure tasted good. Everyones bellies are full and all is cleaned up!!! But I thanks God for all that we have and pray you all are blessed also. Happy Thanksgiving everyone. I just wish I could find cranberry sauce here in Norway. 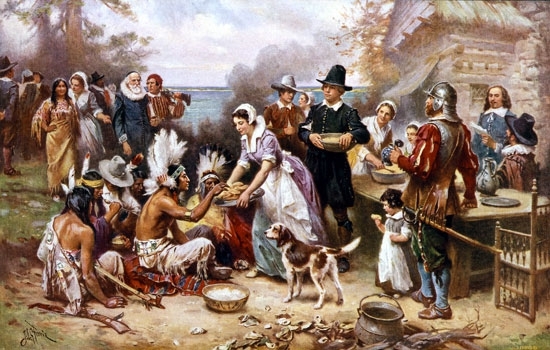 Thanksgiving happens because some native americans helped europeans/"new-americans" survive. It was a bad move from native americans as the europeans/"new-americans" were not so kind to them and didn't deserve to be helped. Yes, it's a nice date to celebrate with the family, but when you celebrate please take two seconds to think on the native americans and with what they have lost for helping the white people. Really sorry to bring confusion and stress to this post, but the history is someting that should be remember in a all, and not just the good parts. Just looked at the painting! Really funny, in it the native are being feed instead of feeding. What a big lie! You knew you shouldn't have posted that, so you're apologizing for it, but you went ahead and did it anyway. Discussion politics and religion aren't permitted here because all they do is cause fights - it's really unfortunate that these were the first two posts you decided to make to our forums. Regardless of my personal feelings on this matter, I'll say this much: at some point, you have to stop blaming people for the actions of their ancestors. It's been several hundred years, so maybe it's time to let go? I'll say this much: at some point, you have to stop blaming people for the actions of their ancestors. It's been several hundred years, so maybe it's time to let go? Btw there is nothing new here: In the 400 B.C. the Celtic Chief Brenno was cought by the defeated Romans manipulating the scale weighting the gold they agreed to pay to the Barbarians as reparations; Brenno replied "Vae victis" (Woe to the vanquished) and dropped on the scale his sword so to increase the already set quantity of gold the Romans had to pay.